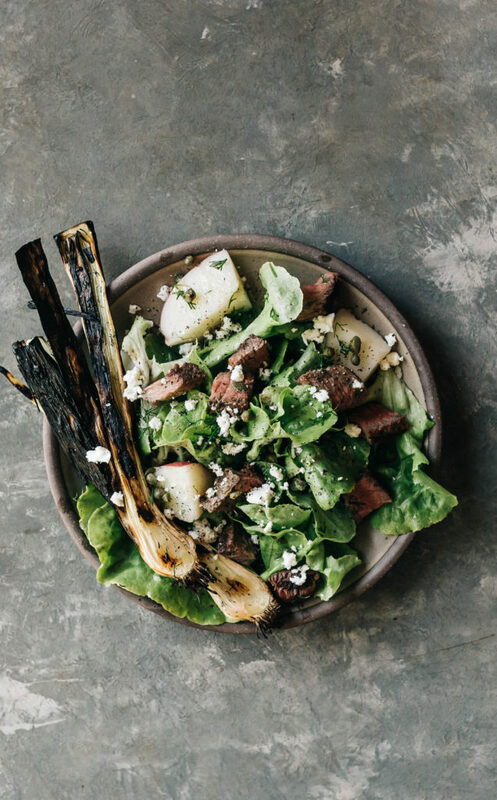 This steak salad is a light and flavorful meal that is easy to whip up on a hot summer evening. We’re in the middle of our second heatwave of the season and standing in a hot kitchen just isn’t desirable this time of the year. However, we still need to fuel ourselves with nourishing food and this recipe is a great one to turn to when we’re too hot and tired to do anything more involved. Between the fresh herbs, salty capers, tender meat, and perfectly cooked potatoes this is the kind of salad that will be on repeat all summer long. We hope you all enjoy this simple meal as much as we do. Prepare the dressing by adding all the ingredients to a small mason jar. Secure with a lid and shake until thickened. Place the potatoes in a medium saucepan and cover with cold salted water. Bring to a boil, reduce heat and simmer until tender. About 8-10 minutes. Drain and then place the potatoes in a bowl and toss with 1/3 cup of the dressing. Let the potatoes marinate in the dressing while you prepare the rest of the salad. Heat an outdoor grill to medium-high heat. Season the steak with plenty of salt and pepper. Drizzle the leeks with olive oil and season with salt and pepper. Place the steak and the leeks on the preheated grill and cook the steaks for about 4-5 minutes per side or until desired doneness. Cook the leeks for about 3-4 minutes per side or until charred and tender. Remove from the heat. Let the steak rest for about 5 minutes before slicing into bite size pieces. Add the torn lettuce leaves to the bowl with the potatoes. Toss in the steak pieces, dill, capers and goat cheese. Drizzle with more dressing. Divide between plates and top with the leeks. Season to taste with salt and pepper.